Anne. 1702-1714. Æ pattern farthing. 5.08 gm. 22 mm. 1714, by J. Croker. 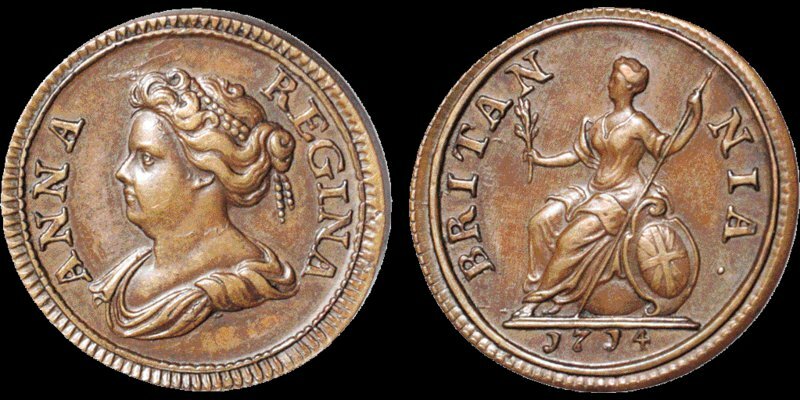 Her draped bust left; ANNA REGINA around / Britannia seated left; BRITAN—NIA around, 1714 below. S. 3625. BMC (Peck) 743. Extremely Fine; glossy brown patina; minor die flaws. Attractive. Rare.